Food Hunter's Guide to Cuisine: My Favorite Caesar Salad Recipe & A Giveaway! 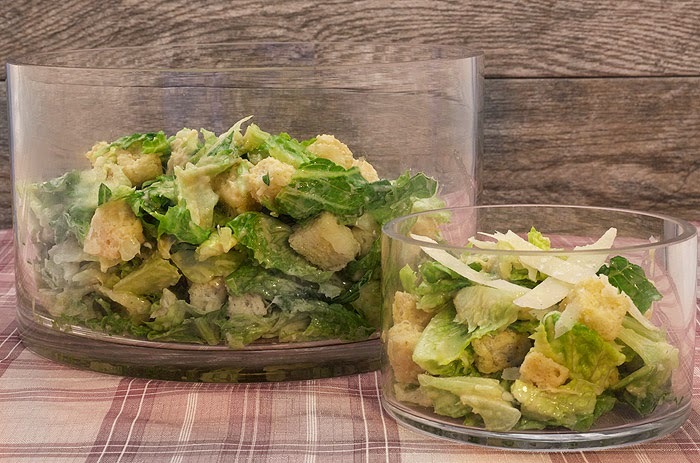 My Favorite Caesar Salad Recipe & A Giveaway! It goes without saying that Caesar Salad is one of the most popular salads around. Found on restaurant menus everywhere, the combination of romaine lettuce, croutons, Parmesan cheese & tangy dressing is loved by millions. Recipes for Caesar salad vary widely, and often times include using a raw or coddled egg and anchovies. Don't let these ingredients deter you from making this wonderful salad at home. My favorite recipe, the one I've been making for years, uses a hard-boiled egg and it comes out perfect ever time. In honor of National Salad month I've partnered with BigKitchen.com, an online one stop shop for aspiring chefs, and will be giving away a glass salad bowl and four mini bowls from Artland. Crafted from clear, hand blown glass, the cylinder salad serving bowl and mini bowls redefine simple elegance. They are great for any occasion, whether formal or casual, and are dishwasher safe. Though they are ideal for serving salads, they can also be used to serve pastas, side dishes, desserts, and more. If using whole heads of romaine lettuce, remove the darker outer leaves to expose the pale-green center. Reserve the outer leaves for another use, if you like. Cut out the core and separate the hearts of romaine into individual leaves. Wash the leaves in a sink of cool water and drain them well, preferably in a salad spinner. Place the leaves in a large bowl, cover them loosely with damp paper towels, and store in the refrigerator for up to 8 hours. Combine 2 tablespoons vinegar, the lemon juice, garlic, and anchovies in a blender or the work bowl of a food processor. Blend until smooth, adding some of the 1/3 cup olive oil if there isn't enough liquid to move the mixture around the blender jar. Add the mustard, hard-boiled egg yolk, salt, Worcestershire sauce, pepper, and remaining, olive oil if any. Blend until smooth and creamy. Taste the dressing; if it's a little too tangy, pour in a splash or two of olive oil and blend until it's incorporated. Cut the lettuce leaves into 1-inch pieces, and place inside your bowl. Pour the dressing over the salad, add a splash of vinegar and a healthy splash of olive oil, and toss until all the leaves are coated with dressing. Toss in the croutons and ground black peppers to taste. Lastly (so it doesn't clump), sprinkle the grated cheese over the salad, tossing as you add. Serve in bowls and, with a vegetable peeler, shave some of the block of Parmigiano-Reggiano over each serving. I'm your long time friend on Facebook! My favorite salad - hmmm I like so many! My fav is probably a summer salad, that has a mix of different lettuces, watermelon radishes, carrots, beets, strawberries, blueberries, raspberries, apple, blood orange sections, vidalia onion, fennel, walnuts, mild cheddar chunks, and a dressing of unrefined walnut oil and raspberry vinegar. Need I say it is usually a huge salad!! I love a mixed garden salad with many different veggies on top of romaine lettuce. I add flair with sliced strawberries, dried cranberries and roasted pecans! I make an awesome chicken salad with dried cranberries (or raisins), mayo, salt, pepper, and curry powder. For crunch, I will sometimes add in celery or green onions. I love fresh fruit salads and spinach salad with warm bacon vinaigrette. I love the idea of using a hard boiled egg in the dressing. Really delish! I love Caesar salad and have yet to find a recipe I like for home. I look forward to trying. My favorite salad is spinach/bacon salad. My uncle/aunt used to own a French restaurant that would make Caesar salad table side and I haven't had a good Caesar salad in a long time. Thank you for sharing this on The Weekend Social. I used to ADORE these salads!!! Sadly I cannot eat cheese or eggs anymore :( But I do love me some anchovies!! I so love Caesar Salad–I’m going to bookmark this and make it for lunch next week!! Pin your post and giveaway! I am big on ceasar salad, I really love BLT salad, sooooo yummy! I love salad with romaine, tomato, avocado, cucumber, kidney beans, sunflower seeds and some kind of fruit. Looks like a wonderful recipe, though I may omit the anchovies :-). Pinning to my salads board. I don't have a favorite salad I just like one that has lots of veggies and perhaps some apples and grapes.